Think managing up is just brown-nosing in disguise? Think again. 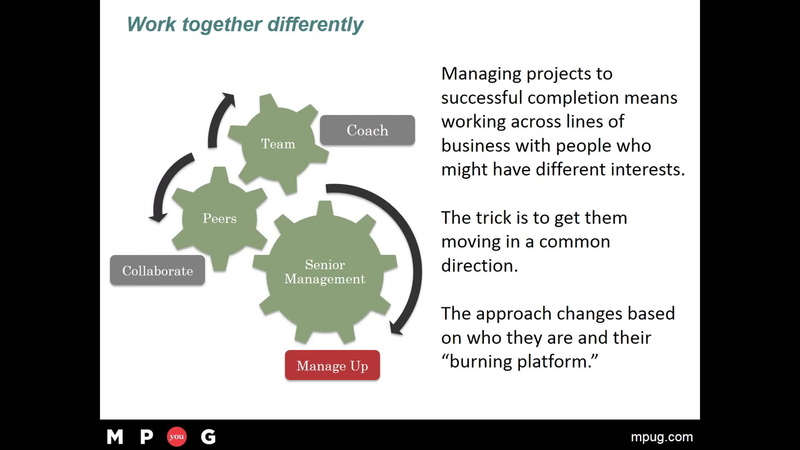 Managing up in projects done well will bring clarity, commitment, ownership, and support your project needs to meet time lines, get resources, and nail project objectives. In this webinar we explore how to work with higher ranking stakeholders in way that gets results and creates wins all around. Alison Sigmon is a longtime PMP-certified project manager, clinical therapist and business executive. She has led projects for software and user experience design; digital content strategy; brand design and development; marketing, advertising and communications strategy; business development and fundraising; video design and production; and ecommerce. Alison’s efforts focus on the behavioral side of project management and relationships. Delivering Bad News in Good Ways is Alison’s first book, and the first in a series on the subject. An avid distance runner, writer, hiker and traveler, Alison is a Gulf War veteran. V. good. Practical information delivered in a concise fashion! Just was busy PMs need.